Howdy! Just wanted to pop in here and give you some updates on what’s happening and what’s to come. I received word last night that another cottage has opened up for the weekend of my Mixed-media Mini Book Mystery Retreat. This means there is space for 4 more students for the weekend of Feb. 15-17 at Sunset Shores in Clare. I need to know of interest by Friday (Feb. 1) and payment can be made to me via cash, check, or credit (through Etsy). Email me at lneffscraps@gmail.com. Participants will be the first to create two new mini books on my teaching schedule for this year! Join me for a fun-filled instructional weekend retreat at Sunset Shores Cottages nestled along the edge of Stevenson Lake in Clare, Mi. This retreat is all about mini books and mixed-media and it’s happening soon! 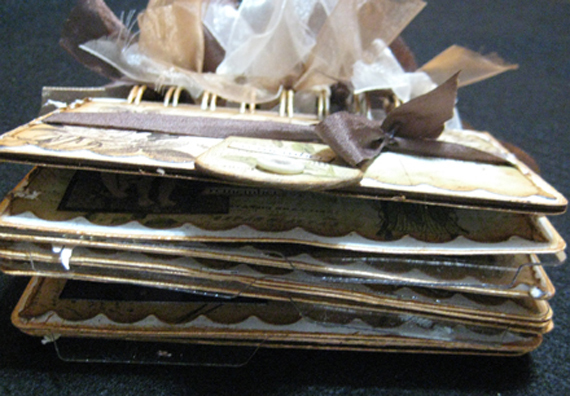 This Mixed-media Mini Book Mystery Retreat is slated for Feb. 15, 16 & 17, 2013. Attendees have an opportunity to create two eclectic and vintage-style mini books, plus a third mystery project over the weekend. It’s an intense weekend of painting, inking and experimenting with new-to-you techniques and I promise everyone a very exciting, creative weekend. Space is limited to 12. You’ll be housed among four cozy, adorable cottages (three to a cottage) and will enjoy learning and working in the spacious craft room and taking delicious home-cooked meals in the dining room with views overlooking the lake. Your creative mystery weekend includes lodging, meals, beverages, and guest thank you bags, along with materials and personalized instruction to create three projects. Cost of the weekend is $285. My very first retreat weekend adventure was held here last August and we had so much fun and the students really enjoyed their projects. I hope you’ll join us this year for another great weekend of crafting! I’ve been busy adding new stores to my teaching area and am happy to announce it now includes Scrapbook Peddler in Saginaw, The Paper Hollow in Sterling Heights, Altered Art Addicts in Jackson and Inspiration Station in Ovid. There are several mini books and card classes on the agenda and I’m in the process of finishing up a new Tempting Techniques Tag Reference Book (former Ranger Ramblings). Classes are beginning in February with my Retreat at Sunset Shores, and March in the stores. Some are scheduled into May with more to come! Check out the link to my Class Calendar and Schedule for information and register for these classes currently scheduled at your favorite store. And, if you haven’t already, please ‘like’ my Facebook page for additional class updates and crafty information. I’m passing along some information from my friend Vivian who owns and operates Cottages at Sunset Shores in Clare, Mi. When looking for a nice tranquil and serene place to escape to for a scrapbooking weekend, quilt retreat or just a few days away with the girlfriends, check out Sunset Shores in Clare. A short two-hour car ride from the Howell/Brighton area makes it the perfect place – far enough away the family won’t bother you, but close enough in case of an emergency. The cottages are available year-round, weekday and/or weekend. Lots of festivities take place in and around the Mt. Pleasant and Clare area throughout the year and these cottages are a great getaway. Soaring Eagle Casino is 20 minutes down the road and there are quite a few top-notch golf courses as well. Great fishing on Stevenson and surrounding lakes, and the lake is perfect for kayaking, canoeing and swimming. I’ve stayed here mid-week with my sisters for a few days just to sit around and chat and share a bottle of wine and Dennis and I spend at least one week of vacation here during June. We like to stay in the cottages any time we can sneak away for a day or two; it’s just very peaceful. Love sitting on the deck overlooking the lake and reading a good book. In addition to mid-week openings this time of year Vivian also has the following retreat weekends (includes meals & lodging) available. Visit Sunset Shores for more info and call her at (989) 386-7030 to book your reservation. Wish I lived closer… I’d be there in a heartbeat! Nice to hear from you, Sharon! Maybe next time. Wish I could join you on your retreat … it was SOO much fun last time and my window is one of my favorite projects ever! If anyone is thinking of going, let me just say that between the food and instruction, it is an incredible bargain!